Today, many of the things we’re able to do at Chisholm Trail Dental Health would have been considered sci-fi just a few decades ago. Now, we’re able to capture and display X-rays in a matter of seconds and create exhaustively detailed models of the teeth without even touching a patient. It may sound farfetched, but here, it’s just business as usual! Dr. Asay is always investing in new technology to improve our patient experience and level of care, and you can come to see it for yourself by giving us a call today. It can be hard to truly understand what is going on in your mouth when you really can’t see anything, but our intraoral camera provides a quick solution to this problem. 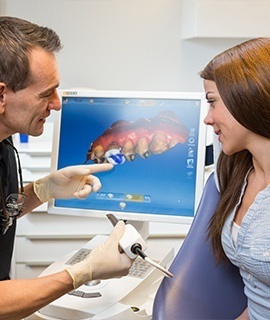 A camera-tipped wand fits easily into the mouth, and it’s able to create high-resolution images of the teeth and gums we can show you on a monitor seconds after capturing them. Now, you and Dr. Asay will always be on the exact same page when it comes to your dental health, helping you make more confident care decisions as time goes on. Impressions give us the ability to deeply understand how all of a patient’s teeth work together, and to create one, we no longer have to have someone bite down onto cold dental putty for minutes at a time! Instead, a few non-contact scans of the mouth are all we need to generate a profoundly detailed model of the teeth and bite, helping us plan and design a wide variety of treatments to ensure they have the perfect look and fit. 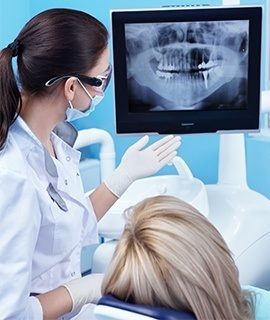 Many oral health problems have initial signs that occur beyond what our team can see with the naked eye, so to make sure we’re able to help a patient as quickly as possible, we use X-rays every day in our practice. Compared to traditional film, digital X-rays are not only much faster, but they create higher-quality images as well. Plus, they also emit up to 90% LESS radiation compared to traditional radiography, which is especially good news for parents with small children.